At the turn of the century an intimate alliance of philosophers, poets and theologians discovered the incarnation of their aspirations for a spiritually transformed world in the symbol of Sophia, the Divine Wisdom of God. Under her various aliases as the Divine Feminine, the Wisdom Clothed in the Sun and the Beautiful Lady, this feminine archetype usurped the traditional role of Christ as the mediator between heaven and earth. She was, however, primarily the inspiration of the Russian philosopher-poet, Vladimir Solov’ev (1853–1900), who created of her the cornerstone for both his metaphysical and aesthetic systems. This spiritual courtship of the Divine Sophia deeply patterned the literary works and interrelationships not only of such prominent symbolist writers as Aleksandr Blok and Andrej Belyj, but brought to light religious eccentrics like Anna Schmidt in a scandalous fashion. 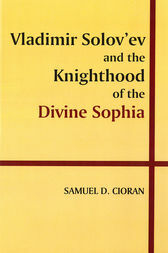 Sophia’s influence ranged far beyond the narrower confines of literature and eventually provoked one of the most fascinating debates within the modern émigré Russian Orthodox Church through the offices of Sergej Bulakov, an apparent student of Solovev’s Sophiology.